If you've been holding out to get the Microsoft Lumia 950 XL until a good deal on the handset rears its head, then today is the day! Microsoft is currently selling the Lumia 950 XL for $499. That's down from the regular price of $649 and Microsoft will also throw in a bunch of other goodies with the handset. Remember that Microsoft promotion from several weeks ago that allowed Lumia 920, Lumia 925, and Lumia 1020 owners to trade in their phone in exchange for a $150 discount on the Lumia 950 and the Lumia 950 XL? Well, that deal is still active, and Microsoft's website notes that you can combine the two offers, which means that you'll be able to get the Lumia 950 XL for just $349 if you trade in one of the Lumia handsets listed above. Furthermore, Microsoft is currently offering a free Display Dock with any purchase of the Lumia 950 and Lumia 950 XL. The unique accessory is what enables the cool Windows 10 Mobile 'Continuum' feature and is usually priced at $99. Other freebies include two free audiobooks for Audible, as well as a free year of Office 365 Personal (usually priced at $69.99). Note that Office 365 Home subscribers are not eligible for the free year of Office 365 Personal. Aside from the $150 discount, all of the other deals are available for the smaller Microsoft Lumia 950 as well. Bear in mind, however, that the Lumia 950 XL now costs $499 while the smaller Lumia 950 costs $50 more. 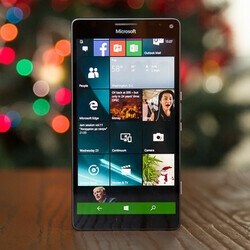 If this seems like a tempting offer to you, then make sure to head on over to our Microsoft Lumia 950 XL review for a detailed analysis of Microsoft' current-gen Windows 10 Mobile phablet. don't buy now. you will get more more more discount if they need clear store. Exactly. Just seriously wait it out 3-6 months. Anywhere in between there. Do not buy this for this amount since you will be stuck with zero updates 6 months after you purchase it. They are completely redoing their OS. Just know that it will be like your rocking symbian or some Palm OS with unsupported software. Total BS, i got my Lumia 950XL since day 1 and MS still updating it! So please do some research! I agree .. that will be in 2-3 months time! Fire sale! I'll pick one up for $99. pass. give it up MS. it's just laughable. Considering that WP is pretty much a dead platform at this point, I'd say this is overpriced by about $490. If Microsoft pays me to use their crap maybe then maybe I'd think about using that junk. I'll go back to WP only if Google's official apps are on the platform. Seems to me that Microsoft is clearing out it's inventory of Lumia smart phones to debut The New "Surface" brand of Windows smart phones that will probably debut in Spring 2017 I think The "Lumia" brand has come to an END DUE TO LOW SALES VOLUME. that Brand had some good smart phones. smart phone makers discontinue brands from time to time. Now it appears the Nokia/Microsoft "Lumia" may bite the dust and go into history.